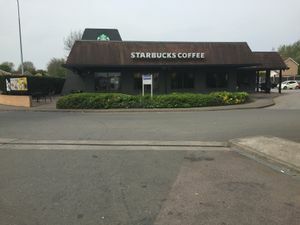 A large Starbucks on the Worksop Bypass. Local facilities in Worksop are advertised from the same junction. Throughout the 1980s Little Chef were planning a restaurant at the next roundabout, one mile to the north of here. This project never happened, but instead Kelly's Kitchen opened a service area in partnership with Petrofina in around 1989. Shortly after Kelly's Kitchen was taken over by Forte and this became a Little Chef anyway. The Little Chef gained a Burger King, but the restaurant closed on 11 January 2012. The forecourt became Total, and changed to Shell in December 2012.